We want to help you keep your DR® 2-Stage Snow Blower functioning in top form. 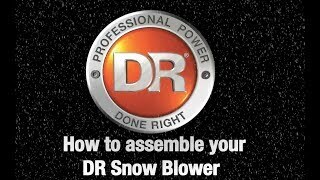 A guide to solving common problems with your DR® Snow Blowers. Most problems are easy to fix. Consult the troubleshooting table for common problems and their solutions. Shut down the engine, remove the spark plug wire keeping it away from the Spark Plug and wait 5 minutes for parts to cool before performing any maintenance procedure or inspection on the SNOW BLOWER. Read the safety considerations section of your Owner's Manual before performing any repairs or maintenance. Recoil will not pull out or is difficult to pull. There may be an oil compression lock in the cylinder. Take out the Spark Plug; hold a rag over the Spark Plug hole and pull the Recoil Cord several times to blow out any oil in the Cylinder. Wipe off the Spark Plug and reinstall it. Check the Engine oil level; the Engine may be seized. The Recoil may be broken or jammed. The Engine will not start. Check the oil and gas level. Make sure that the Fuel Shut-Off is in the ON position. Check that the Spark Plug Wire is attached. The Air Filter may be dirty; change it following the procedure in the Engine Owner's Manual. The gas may be old; change it if necessary. Use a fuel stabilizer if you keep gas longer than one month. Check the Throttle and Choke settings, adjustment and travel. The Spark Plug may be dirty or cracked; change it if necessary. If it's oily, leave it out, hold a rag over the Plug Hole and pull the Recoil Cord several times to blow out any oil in the Cylinder, then wipe off the Plug and reinsert it. The Engine lacks power or is not running smoothly. Make sure the Choke Lever is all the way off. The Spark Plug may be dirty or cracked; change it if necessary. The Engine oil may be dirty. Change it if necessary. Check that the Cooling Fins are clean and free of debris. Clean as needed. Check the oil level and adjust as needed. Check the air filter. If it is dirty, clean or replace it following the procedure in the Engine Owner's Manual. You may be using the wrong oil - too light for the temperature. Refer to your Engine Owner's Manual for detailed information. Clean the Engine cooling fins and the carburetor housing if they are dirty. The Engine runs well but the machine is not Blowing Snow. Augers may not be turning. Check Auger Belt/s and Shear Bolts and replace as needed. Impeller may not be turning. Check Impeller Belt and Shear Bolts and replace as needed. The Wheels are not Turning when the Traction Drive Lever is engaged. Traction Drive Belt is Stretched or worn. Replace the Belt. The Traction Drive Pulley face is dirty or wet. Clean as needed. The Friction Wheel is worn or damaged. Replace as needed. Q: What is EZ-turn™ Steering? A: EZ-Turn™ Steering senses direction automatically as you press the handlebars to turn and adjusts the power to the inside wheel to make turning easier. You'll be able to make tight, 180 degree turns with ease. Q: What are the speed options? A: There are six forward gears ranging from 1.3mph to 2.2mph, and two reverse options, 0.5mph and 1mph. Q: How are DR® products shipped? Q: What happens if my machine needs service? A: Our knowledgeable representatives have an extensive understanding of the DR® Snow Blower and will be able to identify the problem and the best solution. If necessary, we can have replacement parts shipped to you right away, or direct you to one of our authorized DR® Service Centers nationwide. Q: How does your 6 Month Hands-On Trial work? A: We are so confident you'll love your DR® machine that we want you to be able to try it out on your own property virtually risk-free. If at any time during the first 6 months of owning your DR® (6 months from the date it ships) you decide that it isn't right for you, or wish to exchange it for a different model, we will take it back, no questions asked, for a full refund, less shipping to and from your delivery location. See more information here. Q: How does my warranty work? A: DR® machines come with a 2-year warranty (for residential use, 90 days for commercial use) that covers all defects in materials and workmanship. Extended warranties (1-year, 2-year, and 3-year) are available to extend your coverage for a total of up to 5 years. If, while your machine is under warranty, you experience a problem with your machine, your warranty will cover the replacement and installation of any non-wearable parts deemed to be the result of defective materials or workmanship. See more information here. Read this safety & operating Instructions manual before you use the DR SNOW BLOWER. Become familiar with the operation and service recommendations to ensure the best performance from your machine. Your DR® SNOW BLOWER carries prominent labels as reminders for its proper and safe use. Shown below are copies of all the Safety and Information labels that appear on the equipment. Take a moment to study them and make a note of their location on your SNOW BLOWER as you set up and before you operate the unit. Replace damaged or missing safety and information labels immediately. Keep in mind that the operator or user is responsible for accidents or hazards occurring to other people, their property, and themselves. Always wear protective goggles or safety glasses with side shields while using the SNOW BLOWER to protect your eyes from possible thrown debris. Avoid wearing loose clothing or jewelry, which can catch on moving parts. We recommend wearing gloves while using the SNOW BLOWER. Be sure your gloves fit properly and do not have loose cuffs or drawstrings. Wear shoes with non-slip treads when using your SNOW BLOWER. If you have safety shoes, we recommend wearing them. Wear long pants while operating the SNOW BLOWER. Use ear protectors or ear plugs rated for at least 20 dba to protect your hearing. Keep bystanders at least 75 feet away from your work area at all times. Stop the engine when another person or pet approaches. Keep children and pets at least 75 feet from the working area and ensure they are under the watchful care of a responsible adult. Be alert and turn the machine off if children or pets enter the work area. Never allow children to operate the SNOW BLOWER. Never open the Control Box cover. Never attempt any electrical repairs yourself. If in doubt, consult a qualified electrician. Never use an extension cord that is not rated for outdoor use. Never connect the Cord to the Snow Blower if there is an electrical hazard present. Never connect the Cord to the Snow Blower in wet conditions. Never connect the Cord to the Snow Blower with a damaged extension cord. Always grasp the electrical cord plug when unplugging the cord from the outlet; never pull the plug out by the cord. Make sure your fingers do not touch the metal prongs when plugging or unplugging. Never Start the Snow Blower unless the electrical cord is plugged into a properly grounded outlet, which supplies 110-120V power, and is protected by a 15-amp circuit breaker. Never tamper with safety devices. Check their proper operation regularly. When using an extension cord, keep the connection between the Control Box and the extension cord well away from any water. Never run the engine in an enclosed area or without proper ventilation as the exhaust from the engine contains carbon monoxide, which is an odorless, tasteless, and deadly poisonous gas. Store all fuel and oil in containers specifically designed and approved for this purpose and keep away from heat and open flame, and out of the reach of children. Replace rubber fuel lines and grommets when worn or damaged and after 5 years of use. Fill the gasoline tank outdoors with the engine off and allow the engine to cool completely. Don't handle gasoline if you or anyone nearby is smoking, or if you're near anything that could cause it to ignite or explode. Reinstall the fuel tank Cap andfuel container cap securely. If you spill gasoline, do not attempt to start the engine. Move the machine away from the area of the spill and avoid creatingany source of ignition until the gas vapors have dissipated. Wipe up any spilled fuel to prevent a fire hazard and properly dispose of the waste. Allow the engine to cool completely before storing in any enclosure. Never store a machine that has gas in the tank, or a fuelcontainer, near an open flame or spark such as a water heater, space heater, clothes dryer or furnace. Never make adjustments or repairs with the engine running. Shut down the engine, disconnect the spark plug wire, keeping it away from the spark plug to prevent accidental starting, wait 5 minutes before making adjustments or repairs. Never tamper with the engine's governor setting. The governor controls the maximum safe operation speed and protects the engine. Over-speeding the engine is dangerous and will cause damage to the engine and to the other moving parts of the machine. If required, see your authorized dealer for engine governor adjustments. Keep combustible substances away from the engine when it is hot. Never cover the machine while the muffler is still hot. Do not operate the engine with the air cleaner or the carburetor air intake cover removed. Removal of such parts could create a fire hazard. Do not use flammable solutions to clean the air filter. The muffler and engine become very hot and can cause a severe burn; do not touch. Your SNOW BLOWER is a powerful tool, not a plaything. Exercise extreme caution at all times. The machine is designed to blow snow. Do not use it for any other purpose. Know how to stop the SNOW BLOWER quickly; see ?stopping the engine? in chapter 3. Wear winter tread boots designed for snow and ice traction to avoid slipping or falling. See manufacturer's instructions for proper operation and installation of accessories. Only use accessories approved by DR Power Equipment. Never use the machine without ensuring that all guards and shields are in place. Never, under any conditions, remove, bend, cut, fit, weld, or otherwise alter standard parts on the SNOW BLOWER. This includes all shields and guards. Modifications to your machine could cause personal injuries and property damage and will void your warranty. Allow only one person to operate the SNOW BLOWER at any time. If the machine should start making an unusual noise or vibration, shut down the engine, disconnect the spark plug wire, keeping it away from the spark plug to prevent accidental starting, wait 5 minutes, then inspect for damage. Vibration is generally a warning of trouble. Check for damaged parts and clean, repair, and/or replace as necessary. Before performing any maintenance or inspection procedure on the SNOW BLOWER, stop the engine, remove the Safety Key, and wait five minutes to allow all parts to cool. Never allow people who are unfamiliar with these instructions to use the SNOW BLOWER. Allow only responsible individualswho are familiar with these rules of safe operation to use your machine. Never overload or attempt to use the SNOW BLOWER beyond the manufacturer's recommendation. Personal injury or damage to the machine could result. While using the SNOW BLOWER, don't hurry or take things for granted. When in doubt about the equipment or your surroundings, stop the machine and take the time to look things over. Never operate the machine when under the influence of alcohol, drugs, or medication. Stay alert for hidden hazards or traffic. Keep all nuts and bolts tight and keep the equipment in good operating condition. Under California law, and the laws of some other states, you are not permitted to operate an internal combustion engine using hydrocarbon fuels without an engine spark arrester. This also applies to operation on US Forest Lands. All DR® SNOW BLOWERS shipped to California, New Mexico and Washington State are provided with spark arresters. Failure of the owner or operator to maintain this equipment in compliance with state regulations is a misdemeanor under California law and may be in violation of other state and/or federal regulations. Contact your State Park Association or the appropriate state organization for specific information in your area. DR® Power Equipment, Inc. reserves the right to discontinue, change, and improve its products at any time without alert or obligation to the purchaser. The descriptions and specifications contained in this manual were in effect at printing. Equipment described within this manual may be optional. Some illustrations may not be applicable to your machine. Regular maintenance is the way to ensure the best performance and long life of your DR® Snow Blower. Note: Please refer to your Owner's Manual for instructions specific to your machine. Please refer to the engine Owner's Manual for engine specific instructions. When performing any maintenance, you must first shut off the engine, wait five (5) minutes for all parts to stop and cool, and disconnect the spark plug wire, keeping it away from the spark plug. Read the safety considerations section of your Owner's Manual before performing any repairs or maintenance. Note: Consider that service intervals show to be maximum under normal operating conditions. Increase frequencies under extremely dirty or dusty conditions. The DR® SNOW BLOWER is warranted for two (2) years against defects in materials or workmanship when put to ordinary and normal consumer use; ninety (90) days for any other use. 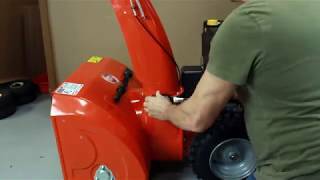 DR Power Equipment certifies that the DR® SNOW BLOWER is fit for ordinary purposes for which a product of this type is used. DR Power Equipment however, limits the implied warranties of merchantability and fitness in duration to a period of two (2) years in consumer use, ninety (90) days for any other use. The 2-Year Limited Warranty on the DR® SNOW BLOWER starts on the date the machine ships from our factory. The 2-Year Limited Warranty is applicable only to the original owner. The warranty holder is responsible for the performance of the required maintenance as defined by the manufacturer's owner's manuals. The warranty holder is responsible for replacement of normally wearing parts such as the Belts, Air Filter, Spark Plug, and Shear Bolts. Accessories to the machine are not covered by this warranty. DR Power Equipment shall not be liable under any circumstances for any incidental or consequential damages or expenses of any kind, including, but not limited to, cost of equipment rentals, loss of profit, or cost of hiring services to perform tasks normally performed by the DR®SNOW BLOWER.